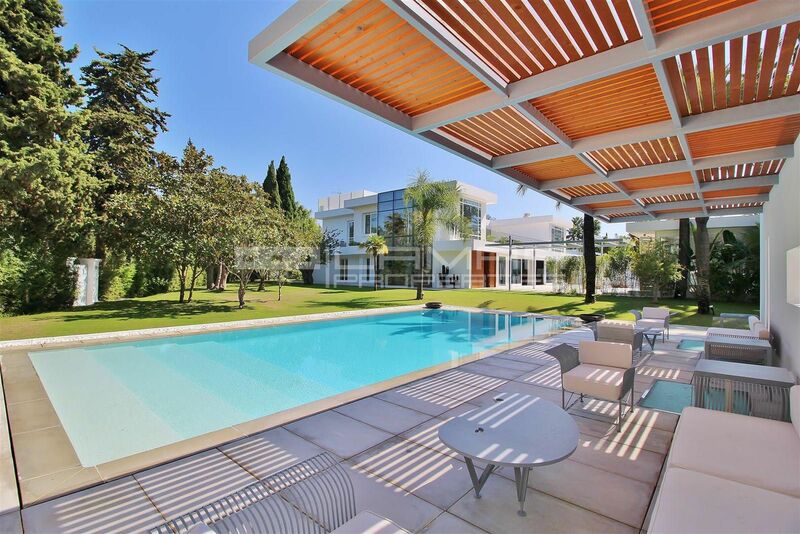 For sale luxurious contemporary style villa situated close to the beach in Guadalmina Baja, Marbella, where the light, design, security and peace in contact with nature stand out. Guadalmina Baja is known for being an exclusive urbanization where the plots and villas built are of generous proportion, through which the southern course of Guadalmina Golf passes. San Pedro de Alcantara and the shopping center are 3 minutes away by car. Puerto Banus about 5 min. and Marbella town 10 min. This villa has been designed with wide open spaces, large windows that allow plenty of light. On the ground floor are the living rooms, TV room, dining room, modern fully equipped kitchen, patios and bedrooms with bathroom en suite. On the upper floor is the master bedroom en suite with a large terrace from which you can enjoy the view to the avant-garde design pond and pool area with several comfortably furnished terraces and sun lounger areas. Next to the pool you will find the gym and Turkish bath.